A dog in Brooklyn, New York miraculously survived a six-story fall after being tossed off the roof by its owner. Oreo, a 1-year-old terrier mix, suffered shattered legs, bruised lungs and severe internal bleeding. 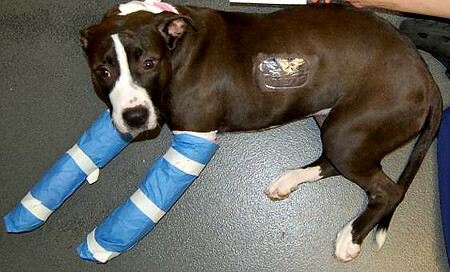 She was taken to a nearby ASPCA hospital where surgery was performed to reconstruct her two front legs. 19-year-old Fabian Henderson was arrested and charged with not only animal cruelty, but with reckless endangerment, as the 45-pound dog could have landed on someone below. Henderson was also charged with criminal trespass, as the building’s roof was off-limits. He faces up to three years in prison if convicted.